Simplify your reservation process with a reservation book from Central Business Forms, a division of The Business Letter, Inc. Printed reservation books are a great, centralized way for you to manage and track your reservations. 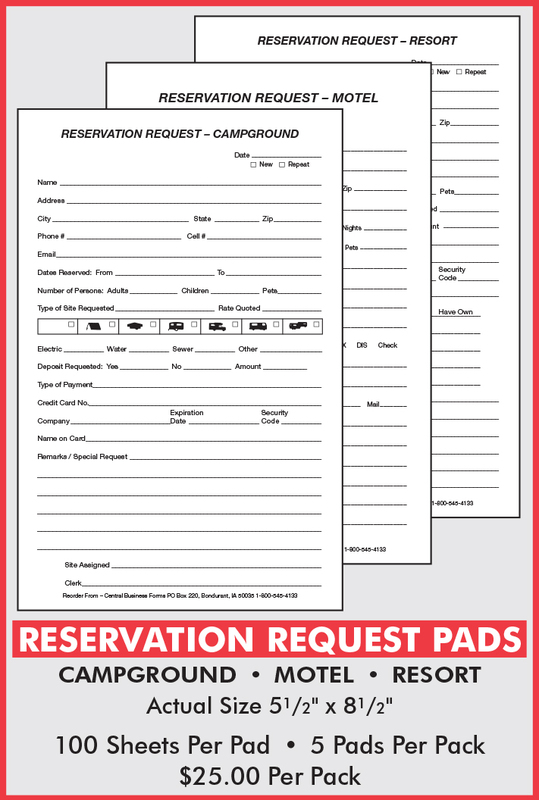 In addition to reservation books, Central Business Forms proudly provides reservation cards and forms to motels, hotels, parks, campgrounds and RV parks throughout the United States. Call us at 800-545-4133 or stop in to order from our many options of reservation books and forms today. Click on the information below to get a closer look at our Reservation Books and Pads - Pricing and Design! Most books are now available "pre-dated" for each calendar year, 2016 - 2020! Custom Reservation Pads available upon request!